In our 17-plus years in the garage door business, we’ve seen firsthand that postponing a repair often leads to the need for even more costly repairs later on. This is especially true when it comes to damaged or broken springs, as a spring failing when the garage door is in motion can cause damage to the door or opener tracks. 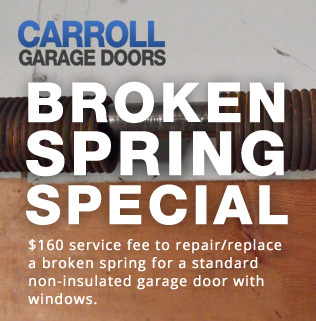 If you notice a problem with your springs, call Carroll Garage Doors for garage door spring repair Camarillo CA immediately. Whether you have a custom door or a brand name door, a broken garage door spring is not a good thing. If you try to use your garage door opener when a spring has broken, you risk burning out your garage door opener motor. Depending on how heavy your door is, you may not be able to open it without a functioning spring to provide lifting power. Don’t risk becoming trapped in your garage by a broken spring!